Freya Cross of The Deep Business Centre with (from left) Dean Bulfield, Scott Clark and Leon McQuade of Think Cloud. The creation of Think Cloud has brought together a high-tech team of 10 under co-founders Scott Clark and Leon McQuade. The pair, who have been working together on projects for the last three years and have a business relationship stretching over a decade, have launched the new venture at The Deep Business Centre in Hull with the ambition to double their people and space during the first few months of 2019. Scott founded Virtual Networking Ltd as a start-up from his parents’ bedroom in 2003 having previously worked as an IT contractor with several blue-chip companies. He now supports a diverse portfolio of more than 150 customers including the Humber Bridge Board and KCOM Stadium as well as charities such as Andy’s Man Club. 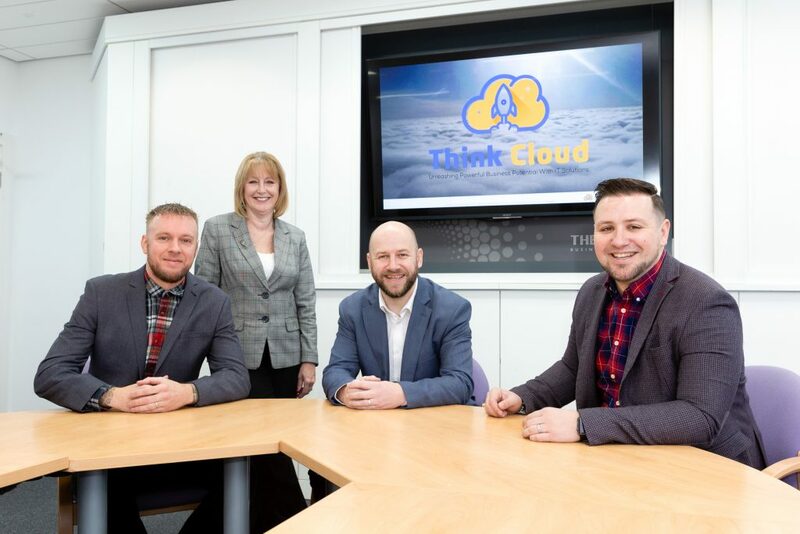 Virtual Networking Ltd – twice listed in the top 50 IT companies by TechnoPlanet magazine – has now re-branded as Think Cloud, re-located from a business park outside Hull to a city centre base at The Deep, and re-positioned to offer services beyond IT support. Leon, a “technology evangelist”, was an apprentice carpenter and joiner before carving out opportunities in technology. His 20-year career has taken him from driving the five-fold growth of a construction sector business dating back more than 70 years to commercial director roles contracted by such brands as Ralph Lauren and Versace. Think Cloud’s approach is based on the belief that traditional IT support is antiquated and that the changing digital landscape will see a merger of the accountancy and IT sectors. The new-look company has invested heavily in adding other services as a re-seller partner for Google Apps for education and charities, Xero for cloud accounting, Unleashed for inventory management and Hubspot for marketing automation. The move to The Deep Business Centre, where Leon previously operated as a virtual tenant, gives Think Cloud a suite of 1,000 square feet with plenty of room for training in the company’s own space and in the Business Centre’s wider facilities. Freya Cross, Business and Corporate Manager at The Deep, said: “The launch of Think Cloud is a really exciting venture for Leon and Scott and for everybody here. Crucially their understanding of technology is all about how they can help businesses in ways which even the business owners haven’t thought of yet! Be the first to comment on "The sky’s the limit as cloud technology specialists launch new venture"